This public meeting is one of three planned prior to construction in summer 2011–if funding supports the project costs. RKK is conducting a survey of the entire route and this meeting was merely to inform residents about the scope of the project, outline some potential improvements, respond to questions, and collect concerns. Everything is pretty sketchy at this point but they’re moving quickly. The second meeting in spring 2010 will be at 30% and the final plans will be presented in the fall. Order of construction at this time is unknown and it may be bid in two phases, depending on project costs. If you have ideas, concerns, or questions, you need to contact Andrew Luetkemeier or Hjarmon Cordero soon. Andrew Luetkemeier, project manager for the City, introduced the various project team members and noted the two project goals: improve connectivity and improve safety for all users (cars, bikes, pedestrians, and mass transit). Embedded in those goals is the desire to raise the road’s design to meet current City standards. Improving road capacity is NOT a goal. 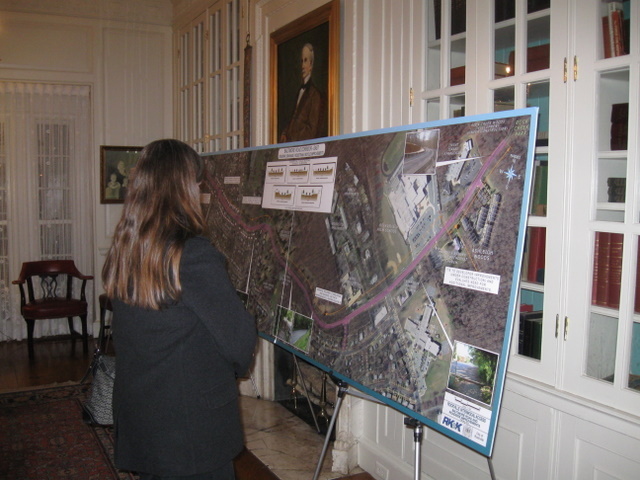 Rick Adams, the project manager for RKK, provided a PowerPoint presentation that followed the route from Town Center to Rock Creek with an interactive map, callouts at major points, and conceptual road cross-sections. Although the project focuses on Middle Lane/Park/Stonestreet/Baltimore Road, it also includes the existing bike path on Grandin. This presentation was far too detailed to present here but among the topics were bus stops, sidewalks, reducing the distances needed for pedestrians to cross streets, curb ramps, signs, paths shared by bikes and pedestrians, stronger roadways, curbs, gutters, and improved drainage. Let’s hope the City can put his presentation online. The presentation was followed by comments, questions by the audience, and responses by staff. For the sake of simplicity, I’ve reordered them by location from Town Center to Rock Creek and conflated the discussion to the major points. Throughout: Lighting levels will be evaluated to determine sufficient levels. All utilities on this route provided by Pepco (wooden poles) but City can pay for more attractive fixtures. Traffic calming needs to be addressed throughout the project and City is considering “bump outs” to narrow the street. Bike Path: Path on Grandin Avenue exists but needs better signage to direct users, especially where the road jogs at Joseph Street. Crossing Park Road is very difficult because of visibility and non-stop automobile traffic. Bikers concerned about sharing a path with pedestrians and that current plans inconveniently jump the path back and forth from one side of the street to the other. City plans to move bike path out of parking lot of Baptist Church (at Twinbrook Parkway) to Baltimore Road. Riders need rutted road edges repaired promptly–that’s where they drive. City seems to have lots of unused right-of-way along Park Road and South Stonestreet Avenue that could increase safety. Trees: Project may require removing some trees but will replant. RKK is surveying all trees (marks on trees do not indicate removal). City does not intend to remove street trees to widen road. Beauty and aesthetics: Several people mentioned the need to consider the appearance and user experience of this road and that it should be attractive. One person suggested trashcans at intersections. Another asked about the relationship of this project with the Recreation and Parks’ Greenways program (see staff report on Joseph Street and mention of a pilot project at a 2008 Recreation and Parks meeting). South Stonestreet Avenue and Baltimore Road: Traffic travels at speeds too high for the limited visibility and City is considering traffic calming soon at this intersection. This area also prone to flooding but City unsure if drainage will be addressed. Baltimore Road and First/Norbeck: Much discussion over this challenging intersection. Many noted the need for a dedicated right-turn lane from northbound Baltimore Road to eastbound First Street to reduce traffic queuing. Several mentioned that the timing for pedestrians to cross First Street is too short; need longer timing or a median for protection. First/Norbeck is a state highway maintained by the county, so improvements will be complex to negotiate. Baltimore Road near Burgundy Shopping Center: More discussion. Residents unclear how it will be possible to add a 6′ wide “shared use path” (bikes and peds) and a sidewalk on the other side without widening road? Current 60′ wide right-of-way doesn’t seem sufficient. Millenium Trail is supposed to 8′-10′ wide. Some people requested that the entrance to the shopping center closest to First should be closed or made an exit only to reduce traffic conflicts. One person jokingly suggested moving the 7-11 elsewhere. Baltimore Road at Woodburn: A short discussion over the raised brick intersection intended to slow traffic. One person believed it was confusing to some drivers (who stopped instead of slowing down) and didn’t deter others (who drove through at full speed). Another resident insisted that it prevented “kids from racing out of the shopping center.” Perhaps this intersection needs a different “traffic calming” device or improved signage. No action from City despite repeated complaints and concerns that someone will be killed. Baltimore Road near cemeteries: Need improved drainage because it floods in moderate rain, which impedes cemetery improvements. Sidewalk is poorly lighted for pedestrians to feel safe. City stated that drainage will be addressed through “pipes in the ground,” not just directing water to culverts and along gutters. 1. Introduction and orientation is crucial. It was great that residents were greeted at the door and that the head of the department opened the meeting–that showed both the serious and welcoming nature of the meeting. However, do review the agenda point-by-point at the beginning so everyone knows what to expect and what to do, instead of simply noting it’s on the handout. When staff are introduced, be sure they are all wearing name badges with their names, titles, and affiliations and that they’re standing at the front of the room where everyone can see them (not behind the audience). We can guess the people in ties and pressed shirts are “official” but we don’t know if they’re city staff or consultants. 2. Facilitate and moderate the meeting, don’t just go through the agenda. Agendas are crucial to an orderly and productive meeting, but it isn’t enough. You’ve got to also manage it, especially if a large group is involved. Explain the meeting rules, be very clear what item of the agenda is under discussion, and provide clear transitions between items. If someone is out of turn, you need to step in politely but firmly so everyone feels fairly treated and the meeting stays organized. At this meeting, a resident asked when he should comment and was told to wait until the presentation was completed. However, a few minutes later another person asked a question, which was then answered and it turned into a small discussion. By the end of the meeting, it wasn’t clear what was happening and it was made even more confusing since some people were leaving. Indeed, the same gentleman asked again if the presentation had concluded and if he could ask questions. Ugh. City staff may feel uncomfortable cutting off a tax-paying citizen when they step out of turn, but believe me, the other residents who are quietly waiting their turn will appreciate it. The person asking the question isn’t intentionally trying to disrupt the presentation; he or she is just eager about a point that’s come to mind. Recognize the point and tell them you’ll address it later–and then be sure to do it (visibly jotting it down helps the audience confirm that you’re listening). And if someone gets offended and angry, apologize but politely restate the meeting rules. If it really gets out of hand, let the other citizens shout him or her down, adjourn the meeting to a future date, or call the police. Meetings are serious business and I don’t like my time to be wasted by disorganization and chaos (especially for an evening after a full day’s work). 3. Have your exhibits available in a couple different formats, at least one that residents can take home. City projects are usually complex and affect lots of people, so they should be communicated in many ways, but particularly in maps, photos, and illustrations. This project goes through many neighborhoods and while the meeting included large maps showing the route and a well-illustrated presentation, there is no map on the City Web site nor a handout with the map. Many people can’t attend public meetings and so rely on materials brought home by neighbors, picked up at City Hall, or viewed on the Web site. And for a road project, the basic form of communication is a map and it should be easily available on the back of the agenda.